It is a consequence of the way sunlight is scattered by haze particles, say scientists. The US space agency probe continues to downlink the information gathered during its historic flyby of the dwarf planet on 14 July. As this data arrives on Earth, the team processes it and studies it. A black and white image of the hazes was previously released, showing them to be as high as 130km above Pluto's surface. That picture came from the Lorri camera and was acquired as New Horizons departed the dwarf, looking back to see sunlight skim the edge of the distant world. This new view comes from the Ralph colour camera system. Again, it is taken with Pluto backlit. Like Earth, the dwarf has a predominantly nitrogen atmosphere (albeit much more sparse). But it is the interaction of this nitrogen with the Sun's ultraviolet light, in presence of another atmospheric constituent, methane, that is able to create the chunky haze particles. 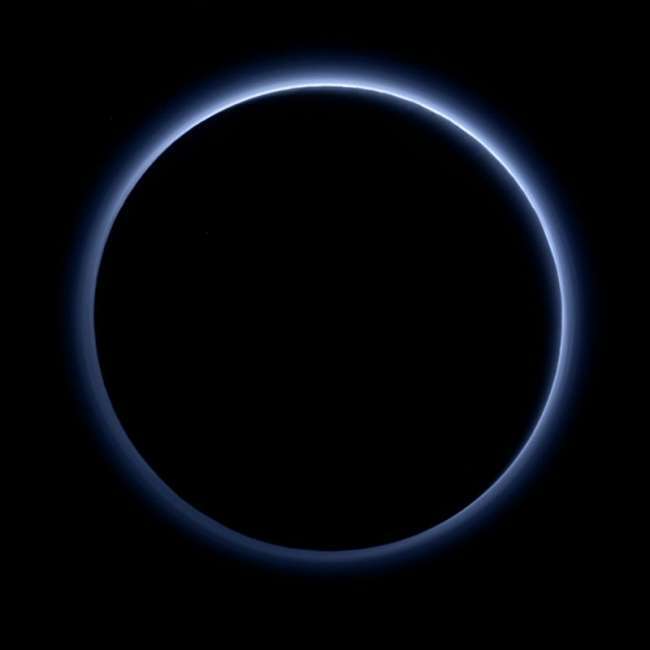 "That striking blue tint tells us about the size and composition of the haze particles," said New Horizons team member Carly Howett from the Southwest Research Institute (SwRI) in Boulder, Colorado. "A blue sky often results from scattering of sunlight by very small particles. On Earth, those particles are very tiny nitrogen molecules. On Pluto they appear to be larger - but still relatively small - soot-like particles we call tholins." The principal investigator on the mission, Alan Stern, had teased Pluto fans in recent days, telling them to expect something special from this week's regular Thursday release of new images. "Who would have expected a blue sky in the Kuiper Belt? It's gorgeous," he said in a Nasa statement. If you stood on Pluto and looked straight up, the sky would actually appear black because of the rarity of the atmosphere. "The haze is pretty thin, so you'd mostly see the colour of the haze as blue sunrises and sunsets," Dr Howett explained to BBC News. The other important piece of news to come out concerns the detection of water-ice at many locations on the 2,300km-wide dwarf's surface. More volatile ices tend to dominate the surface, so understanding why the water-ice is seen strongly in some places is an interesting observation that will need to be followed up, the team says. "We expected water-ice to be there, but we've searched for water-ice in Pluto's spectrum for decades and not seen it before now," tweeted Alex Parker, also from SwRI. Since 14 July, New Horizons has moved more than 100 million km beyond Pluto. And this puts it about five billion km from Earth. The vast separation makes for very low data rates. It will be well into 2016 before all the information is on the ground.